Chief Complaint: Red left eye for the past two months with recent onset of vertigo and otalgia. History of Present Illness: 42-year-old Caucasian female complains of an annoying red left eye for the past two months. On occasion, the left eye has been "aching" with a "pressure sensation". Despite a course of antibiotics to treat a suspected sinusitis, her symptoms persisted and gradually worsened with time. In the past month she also developed vertigo, nausea, otalgia, diminished appetite, as well as progressively worsening vision. Acetaminophen provided moderate relief from her pain. She denied any hearing loss, diplopia, fever, cough, rhinorrhea, otorrhea, tinnitus, and vomiting. She presented to the University of Iowa in the spring of 2007 after having been seen by several doctors and frustrated with her persisting and progressive symptoms. Past Ocular History: Unremarkable for surgery or trauma. Other history as noted above. Medical History: History of hypothyroidism, Type II diabetes mellitus, nonalcoholic steatohepatitis, polycystic ovarian sydrome, uterine fibroids, fibromyalgia, Celiac's disease, and borderline hypertension. Medications: Trazodone, lorazepam, meperidine, levothyroxine, albuterol, fluoxetine, montelukast, and cyclobenzaprine. Additionally, the patient periodically takes a daily multivitamin, fish oil, acetaminophen, and calcium and magnesium supplements..
Family History: No history of coagulopathy. Ocular Examination: Moderate photophobia noted during the exam. 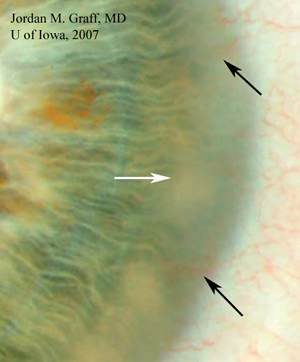 Slit lamp examination: Limbal edema and stromal opacity were noted (Figure 1) as well as several fine vascular loops extending into the mid-stroma of the cornea (Figure 2). There is mild vascular injection, especially inferiorly and at the episclera covered by the lower lid (not visualized in this Figure), associated with tenderness of the globe. Figure 1: Limbal stromal opacity is evident inferonasally in the right eye Figure 2: The iris detail is obscured in the periphery by mid-stromal opacity and edema (white arrow). Fine vascular loops are seen extending into the mid-stroma (black arrows). Course: The patient appears to have interstitial keratitis and episcleritis. 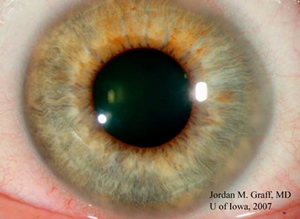 Interstitial keratitis is an uncommon chronic, non-ulcerative inflammation of the corneal stroma that may be seen in isolation or may be associated with uveitis or episcleritis, as was the case with this patient. Symptoms include pain, tearing, photophobia, gradual blurring of vision. Interstitial keratitis presents a very interesting differential diagnosis: unusual infections such as syphilis, tuberculosis, mumps, Lyme disease, Chlamydia, leprosy, brucellosis, Epstein-Barr virus, Rubeola, parasitic infection, or herpes zoster and simplex have all been implicated (Witcup and Smith in Cornea, 2005). Interstitial keratitis may rarely be seen in association with systemic and autoimmune diseases such as Wegener’s granulomatosis, polyarteritis nodosa, rheumatoid arthritis, relapsing polychondritis, lymphoma, sarcoidosis and Cogan’s syndrome. Slit lamp examination, careful history, and appropriate serological testing help to determine the cause of interstitial keratitis, directing appropriate treatment according to the etiology. The addition of otalgia and vertigo in the review of systems for this patient make the likely diagnosis of Cogan's syndrome. Additional evaluation and laboratory testing ruled out other less likely causes of interstitial keratitis in this patient and confirmed the diagnosis. Our patient was treated with prednisolone 1% drops four times a day in the left eye. Laboratory studies showed leukocytosis in the upper limits of normal, mildly elevated erythrocyte sedimentation rate, and non-reactive syphilis serologies. Prompt referrals to otolaryngology and rheumatology were arranged. In the ensuing week after our examination she developed tinnitus, though complete otolaryngology and audiology evaluation showed no hearing loss. MRI of the head performed by rheumatology was negative. At follow up in our clinic one week after presentation, the interstitial keratitis and discomfort from episcleritis had totally resolved. She will be followed closely by the otolaryngology team and oral therapy such as NSAISs or corticosteroids will be initiated if any hearing loss or worsening symptoms develop. The acute stage of Cogan’s syndrome may last anywhere from months to years. The chronic stage may last indefinitely. Discussion: Cogan’s syndrome is a rare, chronic inflammatory disorder commonly affecting young to middle aged adults. Cogan described the syndrome in 4 patients in 1945 as "an interstitial keratitis associated with vertigo, tinnitus, and usually profound deafness" (Cogan, 1945). Since the original description, chronic interstitial keratitis and vestibuloauditory dysfunction remain the hallmarks of Cogan’s syndrome. The etiology is unknown, but is believed to involve autoimmunity to the inner ear and cornea. HLA-B17, HLA-A9, HLA-Bw35, and HLA-Cw4 have been correlated with an increased incidence of Cogan’s syndrome. Cogan’s syndrome is a clinical diagnosis based on the clinical findings and exclusion of infectious causes. Most patients initially present with eye symptoms. The classic finding is interstitial keratitis, which causes redness, photophobia, pain, and blurred vision. Even though interstitial keratitis is a hallmark finding, it is not essential for diagnosis. Inflammation may involve other areas of the eye and result in conjunctivitis, episcleritis, scleritis, or retinal vasculitis. Significant visual impairment may result from posterior scleritis and/or retinitis; therefore, if either is detected, emergent treatment is necessary (Gonclaves et al, 2004). Autoimmune inner ear disease in Cogan’s syndrome produces vertigo, nausea, ataxia, vomiting, tinnitus, and hearing loss. Audiological assessment should be sought to determine if there is any hearing loss. Consequently, prompt referral to otolaryngology is essential as bilateral sensorineural hearing loss may result if treatment is delayed (Chynn and Jakobiec, 1996). Rheumatologic evaluation is necessary for evidence of systemic vasculitis, which is present in many affected patients (Cheson et al, 1976). Some systemic associations may include life-threatening aortitis (up to 10%), inflammatory bowel disease, pericarditis, abdominal pain, fatigue, weight loss, arthralgia, myalgia, fever, headache, and urticaria. Laboratory studies usually indicate leukocytosis, increased ESR, and increased CRP. ESR and CRP may assist the clinician in monitoring disease progression. Treatment: Anterior eye disease in Cogan's syndrome (including interstitial keratitis) is usually treated with topical corticosteroids with or without mydriatics for comfort. Topical or oral NSAIDs may help in the management of associated episcleritis and scleritis. Posterior ocular inflammation is treated with systemic corticosteroids. Any kind of vestibuloauditory dysfunction requires systemic corticosteroids (1-2 mg/kg/day) for 2-6 months duration. Audiometry should be obtained at baseline and may be used to determine the degree of hearing loss. Steroid taper may begin when auditory and vestibular functions are stable. Steroid sparing therapy should be considered in patients where excessive amounts of steroids are required to prevent hearing loss or if significant steroid-related side effects result. In these situations, cyclophosphamide, methotrexate, azathioprine, and tacrolimus have been successfully utilized. Acute vestibular dysfunction may be treated with antihistamines or benzodiazepines and bed rest. Systemic vasculitis associated with Cogan’s is treated with prednisone (usually 1 mg/kg/day) with associated steroid taper. Additional therapy with cyclosporine and/or cyclophosphamide may be necessary depending on disease severity. In the differential diagnosis of hearing loss and reduced vision especially in a young female patient one should also be thinking of Susac's syndrome. Though examination should readily distinguish the two disorders, the physician should consider Susac's syndrome and look for the triad of 1) hearing loss, 2) branched retinal artery occlusions and 3) encephalopathy. Witcup SM and Smith JA. Nonsyphilitic Interstitial Keratitis. In Krachmer JH, Mannis MJ, Holland EJ. Cornea, 2 nd Edition, Vol. 1. Philidelphia: Elsevier Mosby, 2005. pp. 1161-7. Cogan DG. Syndrome of nonsyphilitic interstitial keratitis and vestibuloauditory symptoms. Arch Ophthal. 1945;33:144-9. Goncalves RM, Curi AL, Campos WR, Orefice F, Machado DO. Posterior scleritis in Cogan’s syndrome. Ocul Immunol Inflamm. 2004;12(2):149-52. Chynn EW, Jakobiec FA. Cogan’s syndrome: ophthalmic, audiovestibular, and systemic manifestations and therapy. Int Ophthalmol Clin. 1996;36(1):61-72. Cheson BD, Bluming AZ, Alroy J. Cogan’s syndrome: a systemic vasculitis. Am J Med. 1976;60(4):549-55.